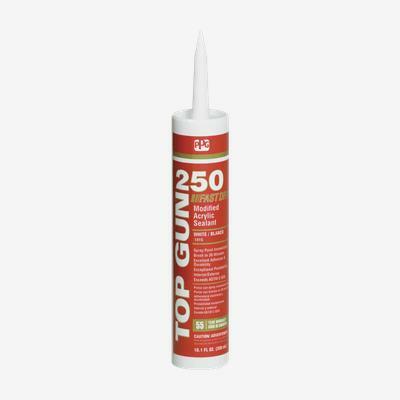 TOP GUN® 250 Fast Dry is a premium (proprietary) modified acrylic based sealant that offers unmatched paintability and durability. TOP GUN 250 allows you to spray paint immediately or brush in only 30 minutes. It forms a flexible, durable, airtight, water-resistant seal. TOP GUN 250 is ideal for a variety of applications, including door casings & jambs, baseboards, window frames, vents, siding joints, eaves, moldings, air conditioner openings, thresholds, counters and sinks. Where applicable, remove old sealant or caulking. Thoroughly dry the joints or surfaces, where the TOP GUN 250 will be applied. Remove all dirt, dust, oil, mildew, loose paint or other contaminants. Before painting, it is highly recommended to test an area first and do not over paint joint (5 mils wet). Certain primers may cause paint film cracking if primer is applied over caulking. Bare surfaces should be primed before caulking.